Integration has risen higher up the political agenda in recent months with policy makers more alert to the high levels of segregation in parts of the country as well as inequality both between and within ethnic groups. This study attempts to find out which are the best and worst integrated places. It uses data from the 2011 census of England & Wales and focuses solely on places (towns, cities, London boroughs) with populations over 20,000 with ethnic minority populations (defined as all non-white British) of over 15 per cent. Integration is an elusive concept. It means different things to different people and often the definition is politically charged. In the context of this study we are taking our definition to be the extent to which people are living and working together and sharing a common national identity. Specifically the focus is on ethno-cultural integration. Those interested in the general findings rather than methodology might skip the next section (albeit glancing at the variables used). This study makes use of a statistical method called factor analysis in order to measure integration. The researcher identifies a series of variables that are on face value valid indicators of the concept that he or she wishes to measure. A statistical model is then estimated that looks to see if these variables share something in common to the extent that they might be measuring the same thing – so called latent variables or factors. Once the underlying data structure has been identified, then the latent variables can be estimated in order to create indices that measure the desired concept. In order to arrive at these groupings, an exploratory factor analysis model was estimated. Scree tests and parallel analysis revealed there to be two underlying factors and so the model was specified as such. The results are presented in the table below.1 The factor loadings represent the strength of the relationship of each variable and each underlying factor. Those in bold represent substantial loadings (i.e. greater than 0.4) meaning a variable is meaningfully tied to a factor. What this model is doing is identifying two measures of integration – identity and structure – that are distinct and broadly uncorrelated (r=0.15). From this model, scores on both these variables can be estimated in order to arrive at two workable indices measuring these two dimensions of integration – identity and structure.2 The resulting indices are standardised with a mean of 0 and a standard deviation of 1. The structure dimension is reverse coded with a multiplier of -1 so that higher scores represent greater integration. Finally, in order to arrive at an overall integration score the two indices were added together. The decision was taken to weight down the identity dimension as it was thought that structural integration was much more important to people’s actual lives and to give them equal weighting would produce an index that would shift the attention away from those places were the need for real day to day integration was greatest. Accordingly, a weight of 1/3 was applied to the identity index. Tables 2 and 3 show the best and worst integrated places in England and Wales. Table 2 shows the best and worst places on each index while Table 3 shows the results of the combined index. What is it about these places that might be key to explaining their high or low scores respectively? Looking at Table 4, we see that the best integrated places tend to be more affluent satellites of Birmingham and London. If we look at the worst integrated places, they are much more northern and tend to be post-industrial mill towns of Yorkshire and Lancashire. The exceptions are: Wisbech, Spalding, and Boston which lie in Eastern England. Generally, the well-integrated places tend to have a smaller minority population and do not have a dominant minority in terms of size. Table 5 presents profiles of each of the best and worst-integrated places. Crucial to the interpretation of these data is an understanding of the ethnic compositions of these places as well as the recognition that different ethnic groups are following different socio-economic trajectories. In Spalding, Wisbech, and Boston, the largest minority group are the ‘White Others’, mostly East European immigrants and they overwhelmingly dominate the minority population. They do badly on both measures of integration. The Eastern Europeans do not need British passports and continue to identify with their home countries. Furthermore, these places tend to have moderate levels of residential segregation plus the minority population is more employed than the majority. What really sets them apart however is economic segregation – these places have the highest levels. The minority populations in Spalding, Wisbech, and Boston are working but they are working apart from the majority. Most of the worst-integrated places that are not in Eastern England tend to have minority population shares composed largely of Pakistanis or Indians. The best-integrated places tend to have White Others or Indians as their largest minority group although they never dominate the minority population in quite the same way as the largest minority groups in the worst places. There are also some surprising inclusions in the best list. Amersham may be there because of the presence of the headquarters of GE Health which would attract a cluster of affluent Americans. Stretford by contrast is relatively deprived and its largest minority is Pakistanis. Now we turn to look at some broader trends. In Figure 1 we have plotted the two indices of integration against each other. The top right quadrant represents the most integrated; the bottom left the least integrated on both indices. Furthermore, the points on the graph have been coloured with lighter blue colours representing larger population shares of Muslims. The points have also been scaled with larger blobs representing greater population shares of Eastern European immigrants (people born in A8 EU countries). As we can see, places with higher shares of Muslims tend to score poorly on the structural dimension. However, they also tend to score highly on the identity dimension. Places with high shares of Eastern European immigrants also score poorly on both dimensions. As we can see, it does seem to be the case that more deprived areas are much less integrated on the structural level and that these often have large shares of Muslims. The Eastern European immigrants would also be found in deprived areas. It is also worth noting that there are places that do seem to have high levels of deprivation but minimal shares of Muslims that are much better integrated than places with comparable levels of deprivation but substantial shares of Muslims. Table 6 details the results of the regression analysis of identity integration. 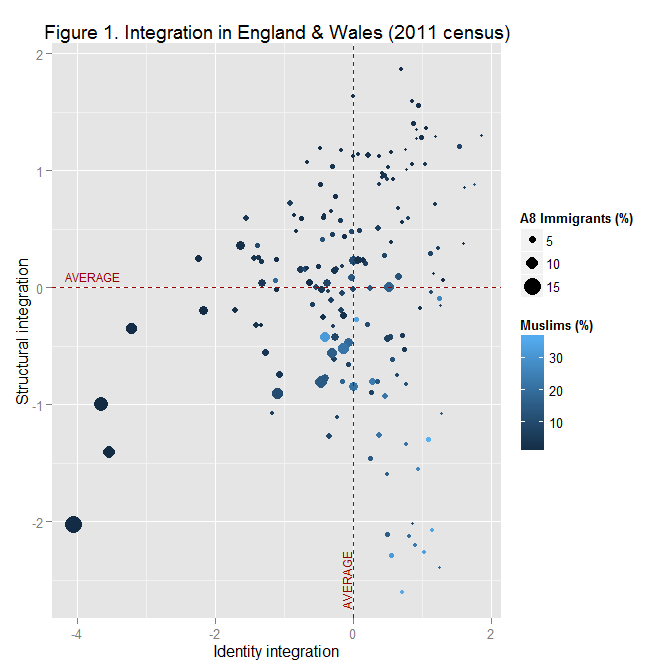 Model 1 shows that the share Muslims is significantly associated with greater identity integration. Model 2 shows a very strong negative and significant relationship between the share of Eastern European immigrants and identity integration. Model 3 shows a small and statistically insignificant relationship between deprivation and identity integration. Model 4 lumps all these variables into the same model; doing so causes the effect of Muslim share to attenuate somewhat although it remains significant. Eastern European immigrant share becomes even stronger in effect while the effect of deprivation becomes more positive and statistically significant. Note that in the simple bivariate models, it is only Model 2 that carries any substantial explanatory power as judged by the R-squared statistics. Table 7 shows the results of the regression analysis of structural integration. As we can see from Models 1, 2, and 3, the share of Muslims, Eastern European immigrants, and deprivation are all negatively as well as statistically significantly tied to structural integration. When these are included in Model 4, we see they all remain negatively linked and significant, only the effects are reduced. Put simply, the places where Muslims and Eastern Europeans live tend to be more deprived and that accounts for some but crucially not all of the lack of structural integration. In order to gain a fuller understanding of the geographical spread of integration, the overall index is mapped in Figure 3. The lighter blue areas represent the better integrated places. Indeed, the least integrated places tend to be in the North West of England while the most integrated places tend to be smaller and scattered around London and to some extent Birmingham. Generally, the findings are what a well-informed observer would expect: integration is least in the Yorkshire and Lancashire mill towns with higher levels of deprivation and large shares of Pakistani Muslims. Also, places with large percentages of Eastern European immigrants have a strong identity divide as well as structural one and this will largely be driven by the fact they are working in industries that many White British people do not want to work in, at least given current wages and conditions. A key point of this study is that there are different ways in which we can think about integration. Two dimensions were identified empirically but there may be more. While we may tend to think of places with large populations of Muslims as being un-integrated, this study shows us that this may be true on one level but not another. In these places there may very well be strong segregation but there is a shared sense of identity. The relationship between deprivation and integration is something that needs to be properly understood theoretically as well as tackled at a policy level. We need a good theoretical model of how these are related that accounts for both individual agency and those circumstances beyond the individual’s control. This is something that can be fleshed out at a later stage. Furthermore, a lack of integration need not be automatically thought of as a problem. These data do not measure the quality of community relations. Of course, all studies have their limitations and this one is no different. This is just one way of looking at things. Generally factor analysis is very much dependent on what you put in the model. Different variables will produce different models and different rankings. In mitigation, the variables selected are broad and cover much of the conceptual ground of what we normally would expect integration to mean. Also, the measurements taken tended to be looking only at ethnic minorities or immigrants as a whole. This means that places with a large share of Poles but no one else from other minority groups will score much less well than somewhere with a large share of Poles and also a large share of say affluent Indians to offset them. Within apparently well integrated places there may very well be pockets of segregation that are overlooked by this method. The data are from the census – the most comprehensive geographical data we have – but they are out-dated. Things will have changed in the five years since the census was taken, some places will have got better, others worse. Another contentious issue is the decision to weight down the identity dimension. 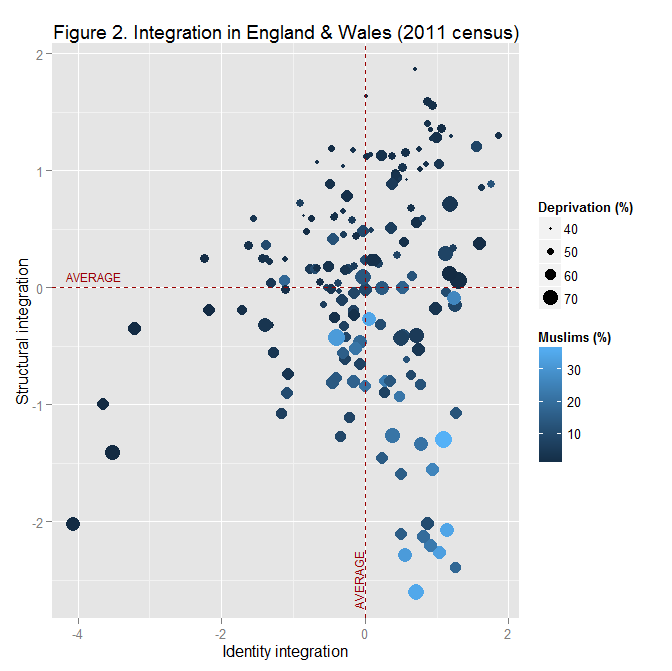 To apply an equal weighting would have given a vastly different final index featuring many places that do not crop up often in the integration debate. However, it was felt that identity is less important as it is broadly reflective of recent immigration status and as the regression modelling showed, much less linked to deprivation. Yes, the idea of a common identity is important in any definition of an integrated society but to focus attention away from those places where the structural divide is most pronounced would have been wrong in our judgement.